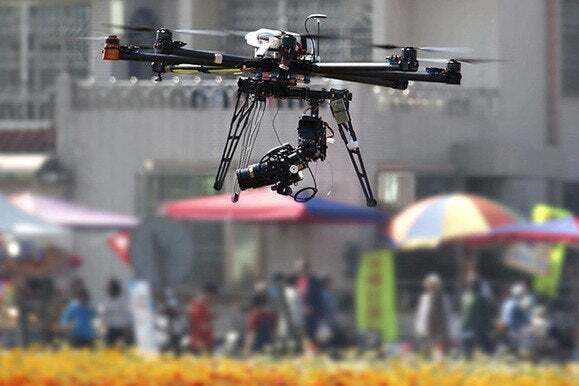 The U.S. Federal Aviation Administration is taking good steps toward “responsible” regulation of small drones, or flying unmanned vehicle systems (UASes), Brian Wynne, president and CEO of the Association for Unmanned Vehicle Systems International, said Tuesday. Wynne praised the FAA, in the midst of a rule-making proceeding for small drones, for focusing on risks associated with irresponsible use, instead of attempting to ban specific technologies. Many technology industries resist regulation, but a regulated drone industry will create millions of dollars in economic activity and thousands of new jobs, Wynne said. Wynne’s group, however, wants the FAA to allow some expanded uses of small drones, including nighttime operations and flights outside the line of sight of drone operators. Wynne said he’s concerned about drone users intentionally violating regulations. “Misuse is misuse, whether it’s somebody who’s had a little too much to drink at 3 o’clock in the morning, trying to impress their girlfriend and ending up on the president’s lawn, or real malintent,” he said. The FAA received about 4,500 pubic comments in its small-drone rule-making proceeding, as of Friday, the comment deadline, noted Robert Pappas, special rules coordinator of the agency’s UAS Integration Office. In addition to the rule-making, the FAA is working as fast as it can to approve commercial drone requests before the rule-making is final, he said. As of last Friday, the FAA had approved 235 exemptions for drones to the agency’s airworthiness certificate rules. In addition to commercial regulations, the U.S. government needs firm rules for law enforcement agencies using drones as surveillance tools, the ACLU’s Stanley said. Drones have “very powerful” potential surveillance uses, he said. Aerial surveillance of cities on manned aircraft is already happening, and it’s likely coming to drones, he said.